Video footage shows Robert Johnson being surrounded by officers before being brutally beaten. Of course, despite the fact that there is video evidence showing unnecessary force, a fact that Mesa Police Chief Ramon Batista acknowledged based on his initial review of the footage, Batista also had to apparently make excuses, claiming that the man didn’t follow officers’ orders to sit down. The incident took place May 23 at an apartment complex where officers were responding to a domestic violence call. The victim, identified as 33-year-old Robert Johnson, is a friend of the suspect. In the footage, Johnson can be seen leaning on a railing while on his phone. An officer can be seen talking to another man who is sitting against a wall. The elevator opens and more cops come out, approaching Johnson and frisking him. Once they realize he has nothing on him, the cops point to the wall near the railing, presumably telling Johnson to move away, which he does while still looking at his phone, occasionally putting it to his ear. At one point, Johnson is leaning against the wall looking down at his phone when four officers start to circle him. Video footage shows the four officers then start to pummel him repeatedly, knocking him to the ground before ultimately handcuffing him and using a zip tie to secure his feet. Johnson was arrested on charges of suspicion of disorderly conduct and hindering. 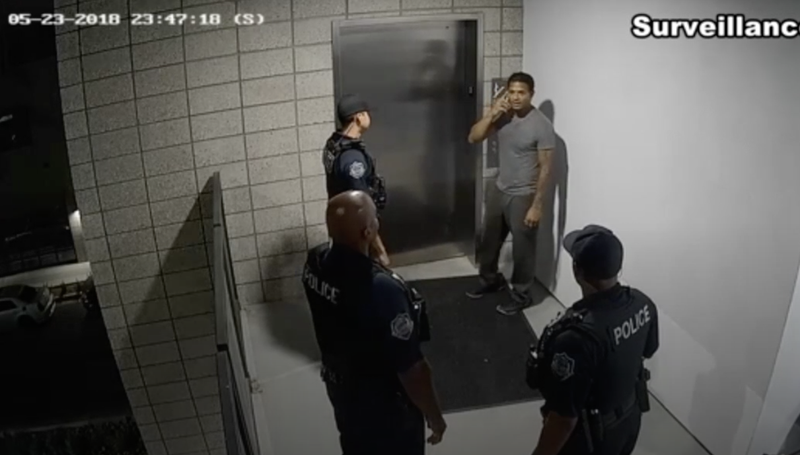 Toward the end of the video, one officer can be seen wrapping a white cloth around Johnson’s face, covering his eyes, before officers pick him up by his feet and arms and carry him into the elevator. “The images of the video are powerful, and I thought it was paramount that you hear it from me with respect to how I feel about it and what I’m going to do to ensure this doesn’t happen again,” Batista told the Republic about his decision to release the video before it appeared online. Batista added that he wanted to provide context (what context?) about the incident. Community leaders and Johnson’s attorneys are skeptical about the case. Andre Miller, a pastor at New Beginnings Christian Church in Mesa, and attorneys Benjamin Taylor and Joel Robbins, who are representing Johnson, slammed the officers for their behavior. But never fear; apparently, the incident has prompted Batista to change the department’s policy so that officers cannot hit a suspect in the face or head unless the person is fighting with them, according to 12 News. Apparently, prior to this change, the policy could have been interpreted as it being A-OK to strike suspects before any altercation ... which sounds about right.